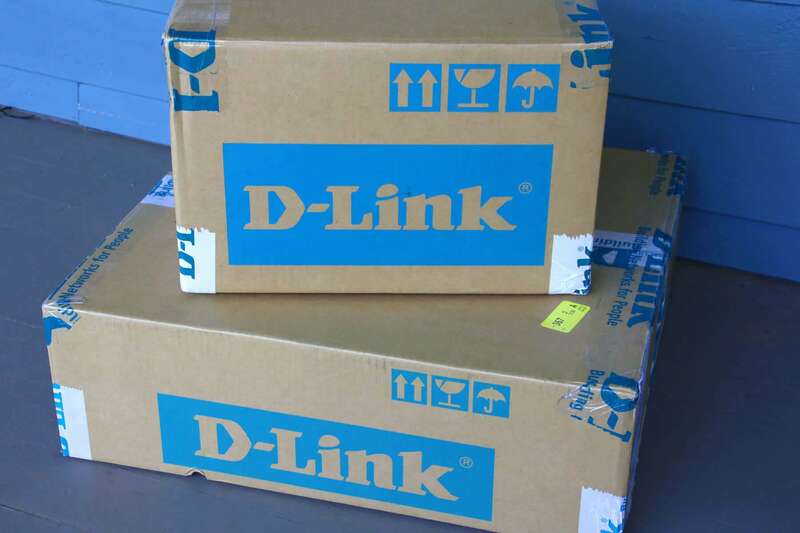 I received these D-Link cameras for review. All opinions are entirely my own. I’m not an overly paranoid kind of person. But I’m also not excessively carefree or naive. I’m not oblivious to the fact that there are people out there, even in the best and otherwise safest neighborhoods, who will trespass onto your property, break into your cars and into your home. And especially since becoming a mother with children to protect, I feel more vulnerable than I used to and have felt the need to take more precautions to ensure my family’s safety. We bought a new home a few months ago on nearly 8 acres of property with multiple outbuildings. That’s a lot of property to look after. And though rural areas generally have less crime and lower break-in rates than urban areas, when you don’t have a neighbor right next to you, you tend to feel a little more vulnerable. So shortly after we moved in we started talking about measures we could take to ensure our family’s and property’s safety beyond the basic alarm system we already had. A guard dog would be great. Better yet, two of them. Loyal, loving dogs that our kids can snuggle with, but ones that snarl and bare sharp fangs towards the right (or rather, the wrong) people. But though we do plan on getting a dog at some point, we don’t want to have to resort to that in order to feel safe. Then we heard about D-Link. And we were really intrigued. 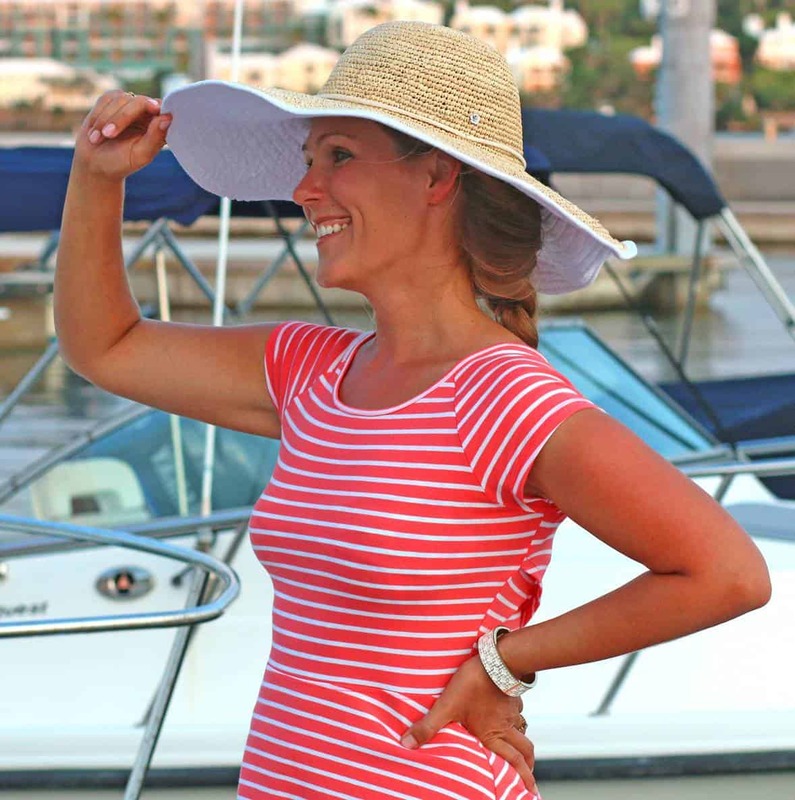 We immediately took the opportunity to try out a few of their products and we’re glad we did. Let me share our experience with you. 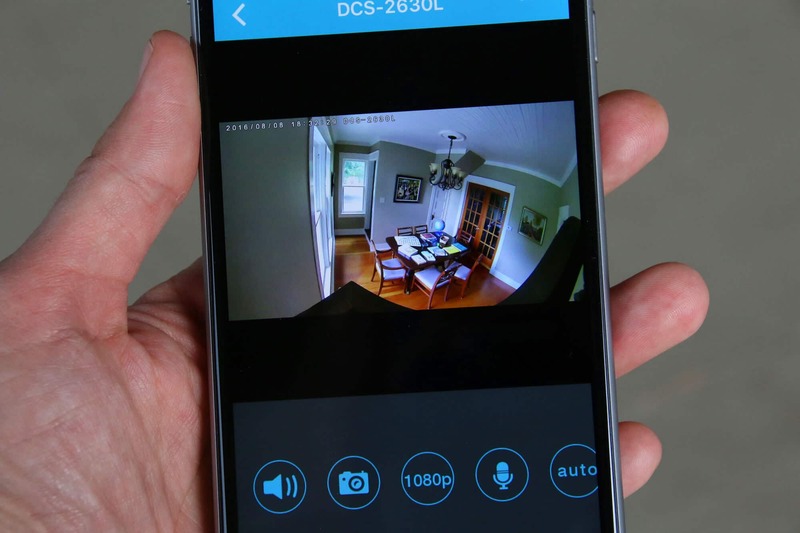 We installed two indoor and two outdoor cameras, all of them PC Magazine Editor’s Choice picks. More on the cameras in just a moment. We hooked them up to D-Link’s Ultra Wi-Fi Router which is also PC Magazine Editor’s Choice pick. And I’m not surprised because it’s so powerful that we have connectivity across most of our nearly 8 acre property. We’re able to connect everything to it including our laptops, iPhones and AppleTV. It’s awesome! Built for today’s connected family and to support a range of devices all connected at the same time – from laptops, smartphones, Smart TVs, gaming consoles and beyond. Stream HD multimedia across your home without interruption. Control your network by enabling parental controls, blocking unwanted devices, monitoring internet activity, and creating Wi-Fi guest networks is simple with the user-friendly user interface. And now for the cameras. Setup is an absolute breeze! Seriously, anyone can do it. And that simplicity is part of the D-Link hallmark. We installed the first one at the top of one of the posts on our back porch. 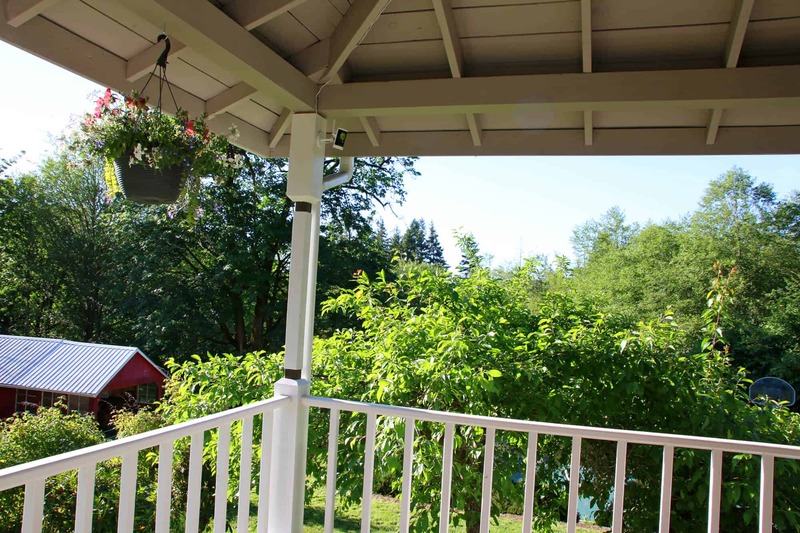 It’s able to take in the length of our back porch and the steps that lead down to the lawn as well as monitor the french doors that go into our living room. The second one we installed at the top of a pole in our pole barn adjacent to our house. 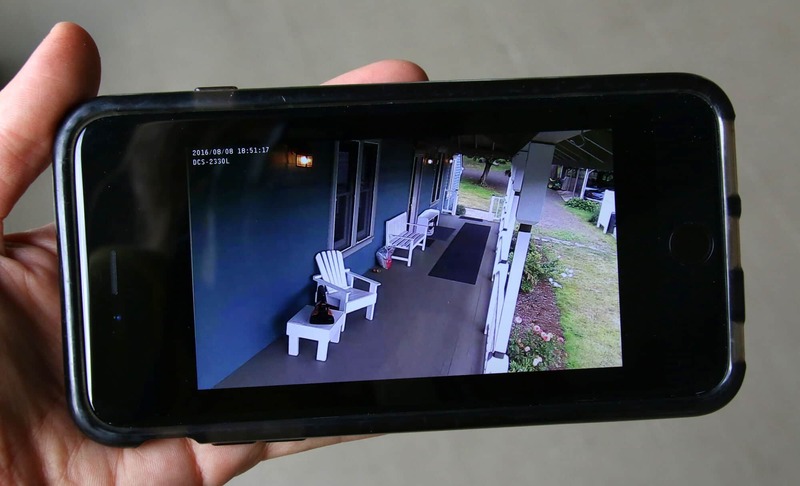 This camera covers the driveway leading up to the house, part of the front lawn, the front porch and the front door. 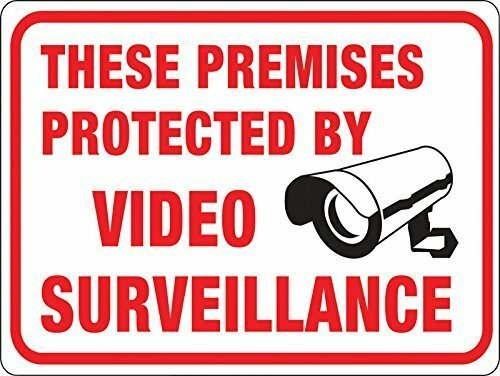 And in case intruders don’t see the cameras and change their minds about doing anything stupid (which in and of itself is a good security measure), we want people to know that we have cameras. You can make it easy for them by enlisting the help of a sign or two around your property. We picked up two of these signs on Amazon. And so what if it looks a little redneck, right? All that matters is that your home, family and property are safe. Redneck or not, as long as it keeps creeps off our property, I’m good with that. 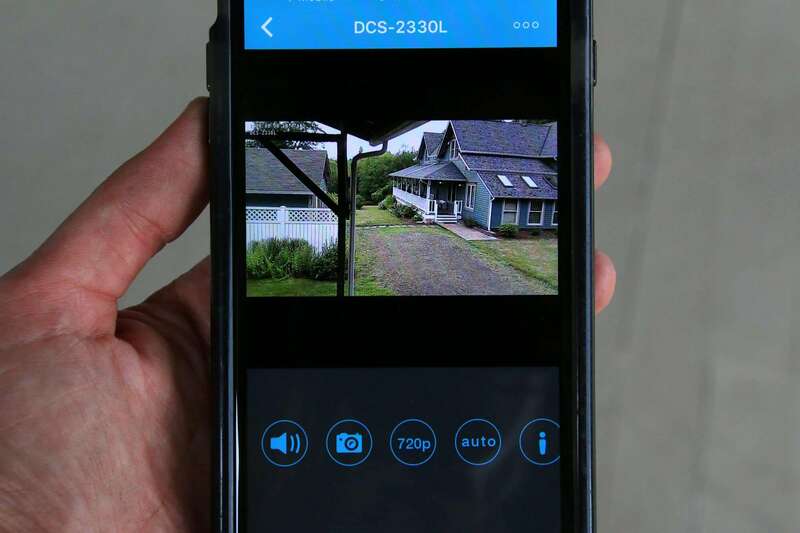 No matter where you are – at work, at the store, on vacation far away – within seconds you can pull out your smart phone and connect via the D-Link app to your cameras. And if anyone’s there who shouldn’t be or someone’s doing something they shouldn’t, within seconds you can have 911 on the line. You can select which resolution you want and even tap into audio so you can HEAR what’s going on, too! The resolution and clarity of the image is very good, so is the quality of the audio. So that if any intruders at any point come onto your property you can…. 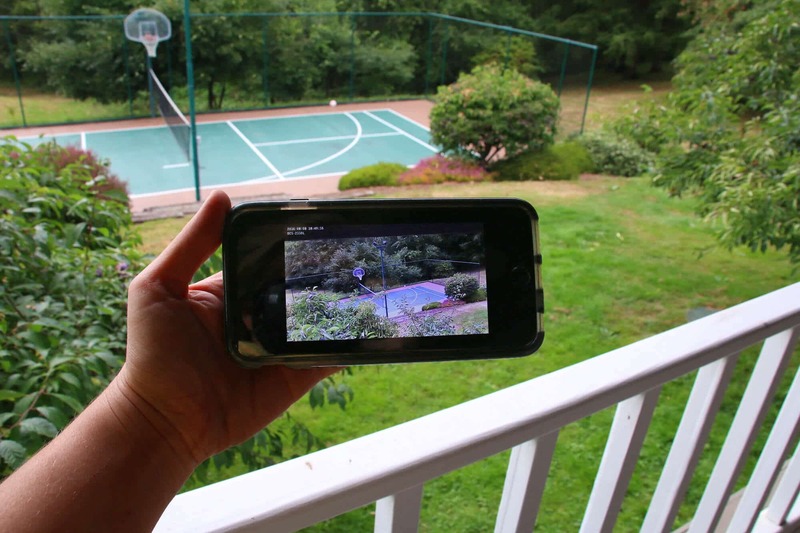 View of the back yard…in case the burglars try to steal a game of tennis. The front porch with a clear view of the front door. Eventually we plan to place cameras in multiple locations and with a simple tap of the screen you can instantly toggle between cameras. It’s pretty incredible. Okay, now what about at NIGHT? The first shot below was taken after 8:30pm when the light was very dim outside. As you can see it does really well even in dim light. We have found that in order for the night vision functionality to work in pitch darkness you need to have a light source next to it. Moonlight is inadequate. That said, you can alter some of the camera settings to improve visibility and we still need to experiment with that. This is two hours later around 10:30pm when it was pitch dark outside. There are no lights near where the camera is installed and that’s our next task, to mount an outdoor light near the camera. 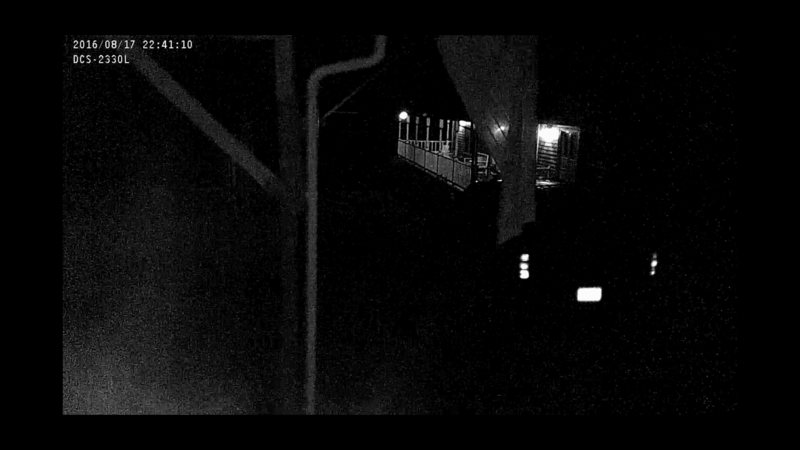 That’s what we did on our porch – we have several lights installed and the cameras perform perfectly at night. Another really cool feature that I already mentioned is that these cameras record video directly onto a microSD card. So you can review past footage at any time. You can’t pull out your smart phone or look at your computer screen 24/7 when you’re away from your home or sleeping and let’s say that someone breaks into your car while you’re not monitoring it. But since you have the footage on video, guess what? We put one on top of a high bookshelf and the other on top of a high dining room hutch so they’re out of the way and have a full vantage point of the room. The picture quality and audio on this camera are excellent! 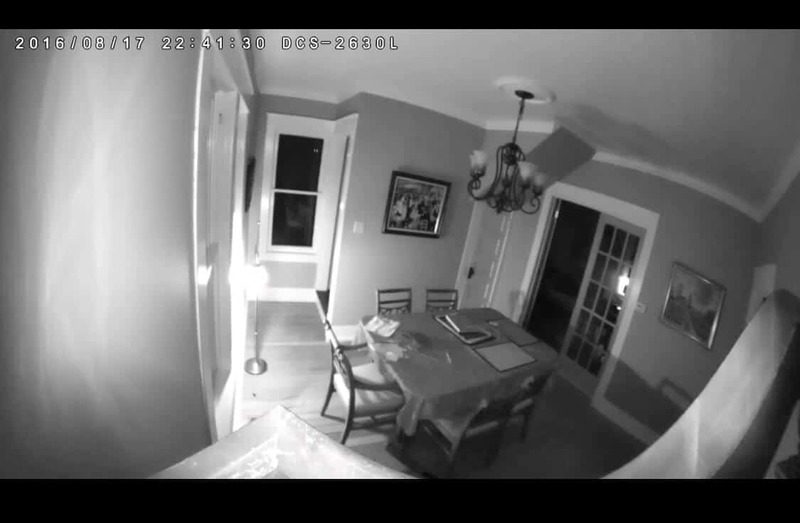 As with our outdoor cameras, we keep a small light source on indoors to assist with the night vision viewability. 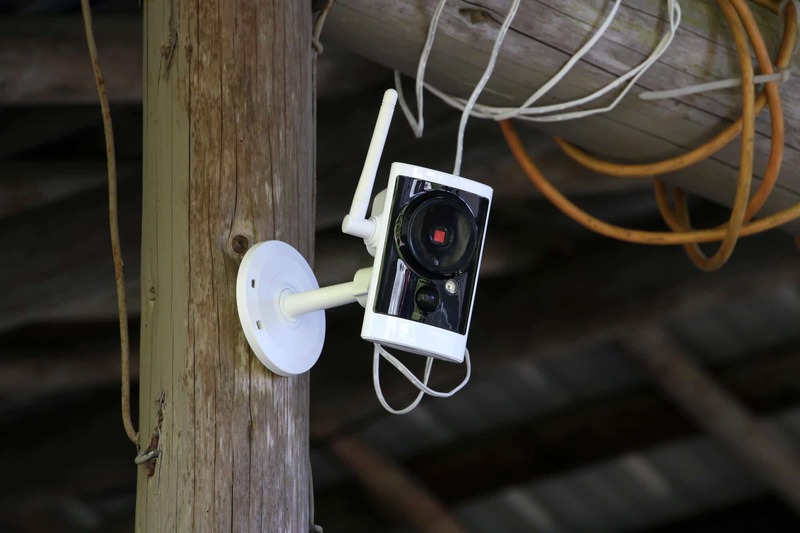 Some additional features of these cameras is the ability to zoom in closer, schedule specific times for your camera to start recording and receive alerts the moment motion or noise is detected. 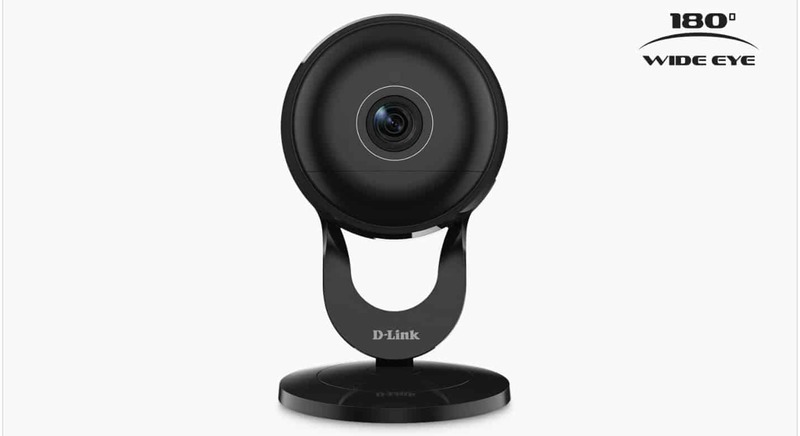 Based on our experience with D-Link thus far we look forward to adding more cameras around our property and trying out some of their other smart devices. Bottom line: D-Link offers state-of-the-art technology to protect your home and family for a minimal one-time fee, the cameras are very easy to set up yourself, the equipment can be added upon and expanded to further equip your home, the devices all work via the Wi-Fi you already have set up in your home so nothing further is needed, and there’s no additional monthly charges whatsoever. 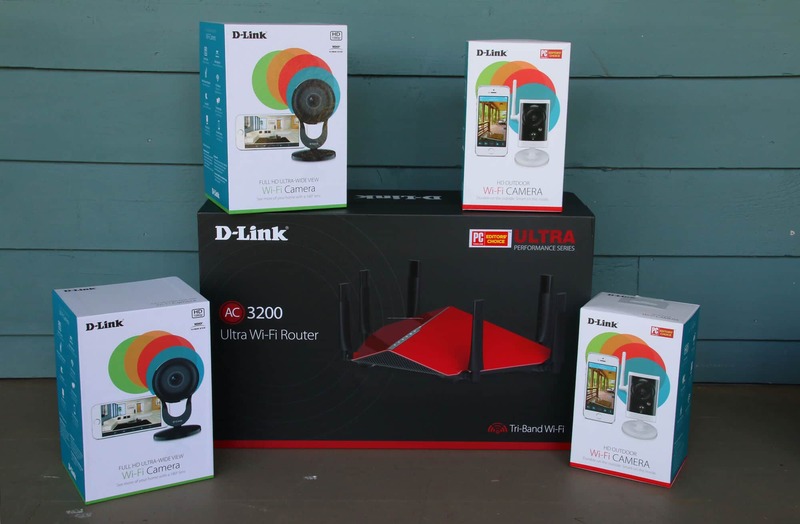 For more information about D-Link and to explore an awesome variety of home security products, visit their site: D-Link. Now, we want you to be able to experience one for yourself and so we’re giving one away to a lucky winner! THIS GIVEAWAY HAS ENDED. THE WINNER IS: TINA W.
Disclosure: We received these products from D-Link for review without any obligation to write a positive review. As always all opinions are entirely our own. So important to be safe and have peace of mind! That would be awesome! I’d probably spend half my time just “playing” with it (and spying on the kids and dogs), but it’s always good to have that peace of mind. I want it for my aging parents so they can be safe. Thank you for this review. We just moved and live way out in the country. I’m feeling a little isolated and have been researching systems just like this. I would feel so much more secure knowing that I can see what’s going on around my house anytime I wish. I think I would install the camera outside but it sounds like I will need to install some lights first :-). Thanks again for the post, you are always thorough and easy to read. Our bedroom is upstairs and we’d never hear anything all the way down two floors into our basement. I’m always petrified of a break in down there. As a survivor of long term domestic violence, with an ex husband who would is still attempting to get to me, home security and surveillance is VERY important to me to be sure that my family and I are safe, and that the past isn’t creeping up on me. Unfortunately, we can’t afford a system of our own. Something like this would be immensely helpful. We had a different system, it has officially passed on to security heaven😔. We are in the market for a new program! This looks great!!! Thanks for the review and info! Great to have , to keep things secure and check on things when one is home or away! Sadly, our neighborhood is frequently targeted for burglary. And now that school has started, the target times of day are from 9-3 when folks are generally at work AND no kids are home. Not good. Have have several neighbors who have security systems like this one, and it would be nice to help out with neighborhood watch even when we’re not here! I would use it to check on my pets when I am not home, and to just make sure everything is safe and sound. I would love to be able to monitor my home while away at work or out of town. I love being able to see it on my phone. Yay for technology!!! I have thought about getting a security system too now that we’ve got kiddos. Thanks for the review! We’ve been looking at new DYI security system. Thanks so much for the great review! My husband and I have been thinking about getting cameras for our house. Thank you for this recommendation! I’m sold! Now I just need a house to protect. :D And your signs don’t look redneck at all! I would like it so i can monitor my house. Plan to place it at the front of the house. So important to have a peace of mind! Always makes you feel better during the day! This would make me feel so much more secure when I am home alone, and just in general for my family’s safety. I live in a rural area without close neighbors. I was wondering what type of security system to get but after reading about the ease of set up and the functions of this system, I think I found the perfect fit. Thank you for sharing. This would really help me and my hubby feel safer. A friend of mine has this and loves it. I think nowadays it really pays off to have that security. I’d say peace of mind definitely outweighs the fear of looking a little redneck. This sounds like a great product. I would have it for the back yard and side door to keep things safe. I would love having those extra eyes. My “guard dog” is getting older, so he can’t quite hear potential intruders as well. Plus, he really just jumps and licks new people, so I’m not sure how effective he’s really been. To add some extra security to my home. It’s always great to be protected! These look like a great choice of camera! 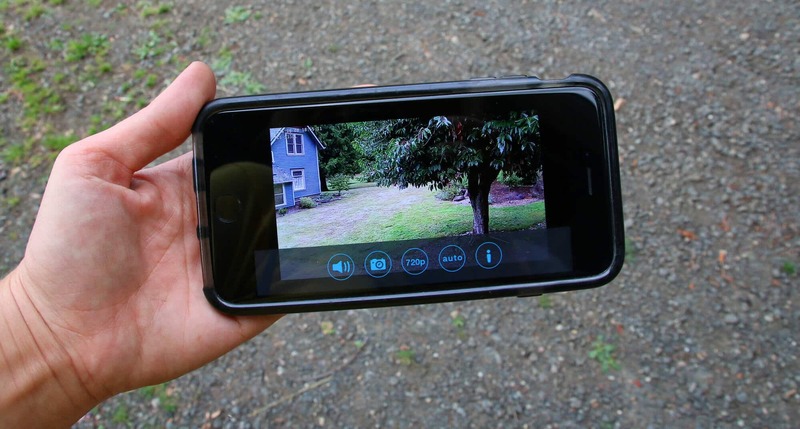 I would use the camera to protect our house and help us feel safe. I would like a camera in our home for the security of my family. I will feel safer knowing that they are there. This is an awesome review. 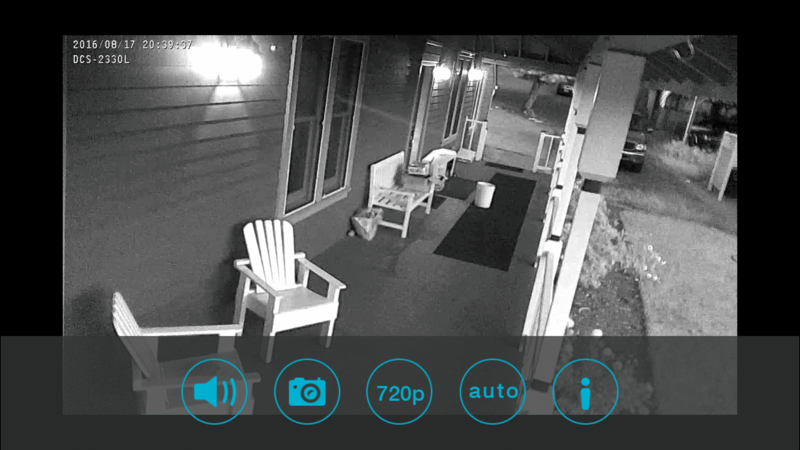 I have one security camera that monitors our front door because we’re constantly having packages stolen. I may have to consider getting more! Yay! My husband and I are in the middle of researching new security options for the house! Can’t wait to check this out with him! What a great idea, and I love how clear the pictures are! I would put this in the front of my home because there’s been several break-ins in the communities around us in the last couple of months. It would help give me peace of mind. My home was broken into when I was a teenager, it’s terrifying. It’s so good to be mindful of safety! Super clear pictures and even at night sounds wonderful. Would love to try this out. I never heard of this system but will be looking into it for sure for our family home in Connecticut. 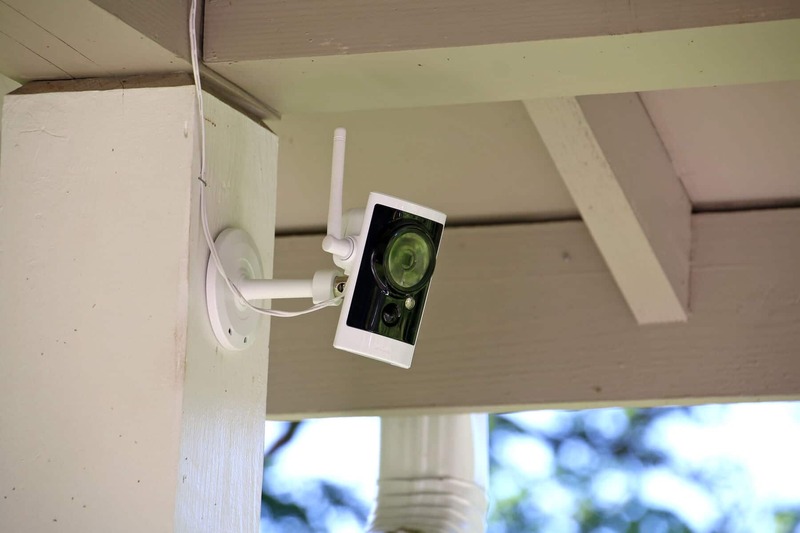 I would mostly likely install one of these cameras in the front of our cottage and one by the back door so I could see if anyone is coming in from the lake/dock side. Thank you for telling us about this system! OMG, jumping Jupiter. This can be a life saver. I live in a poor & crime filled neighborhood. Definitely put it in front door to make sure no stranger walks in. . Thank you for the awesomeness, the contest, and generosity. :) Pick me, pick me! i would love to have it for peace of mind. we are moving to orlando, and i just have heard so much about the crime there compared to where we are now. The house has been broken into a couple of times, and especially when only one person is home by themselves it would be nice to have the extra security. I remember seeing photos of your home after you just moved in. It’s wonderful, and all that property is impressive. 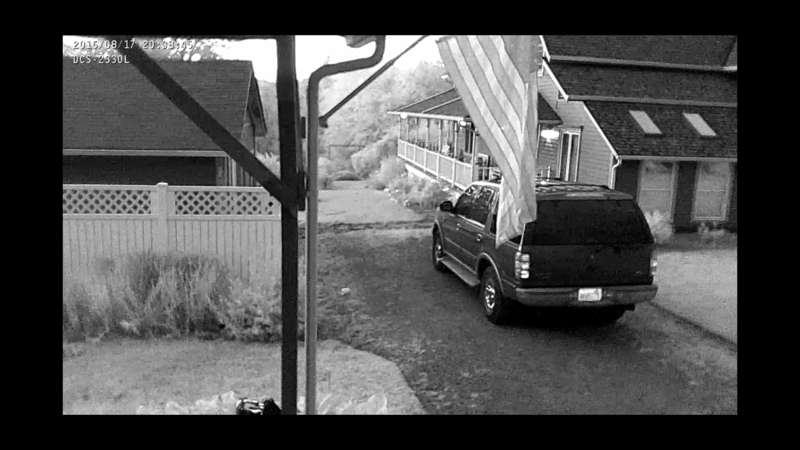 I’m glad your home security camera gives you peace of mind. Who wouldn’t want that type of security, even for a much smaller property? Sounds like something we can use at home just for piece of mind. Thank you!! I would love to win this because someone or some people keep dumping their trash on my property and I need to find the culprit(s). Living on a double corner with businesses on one side, it’s quite dark there. Not a very safe feeling for a single retiree….and it’s very dark and secluded between my home and the house next door which faces the other side street. This would be wonderful for piece of mind knowing that the the house and property are protected by surveillance. I would love to be able to feel safer here. Security is so important in an ever changing world. 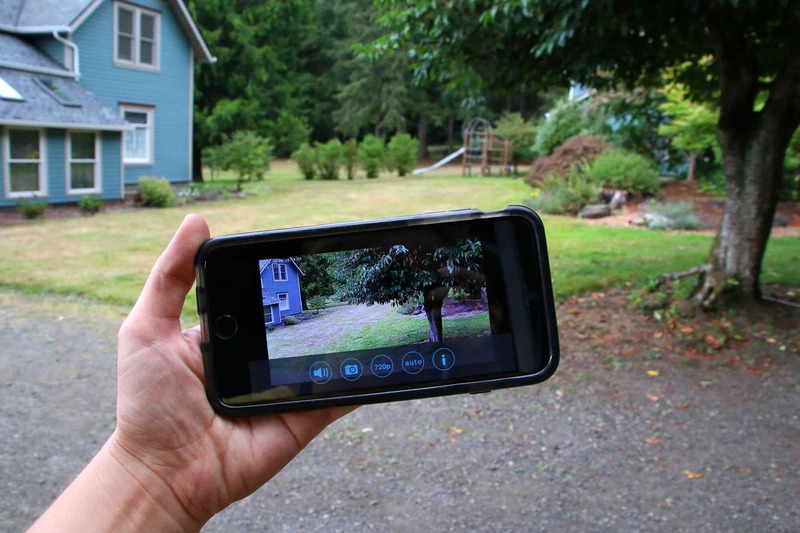 I am moving to a new home, in a new city, and I would like peace of mind that I can check on my dog, check on my house, check to make sure everything is secure using my cell phone. I am a firm believer that it’s good to err on the side of caution and what better way to do it than to be able to check on things when you aren’t there! This advanced technilogical system should be a requirement for every home owner or mentor. We’ve a field behind our home that has been used as a corridor for burglors breaking into cars, taking outdoor furniture, & grills. This D-Link security system would be such a God Send for our family. I’ve 2 “disabled military” veterans (children) that are unable to help with surveillance—“looking outside through the windows” is the best I can do. Thank you ever so much for a chance to win this system. We have a busy Bed and Breakfast with three entrances. Our bedroom is well away from these doors and it would be reassuring to be able to monitor these remotely. Our 125 year old home place burned down in 2014. We no longer had a place to stay when we would go home (which is about every other weekend if not more). We later purchased a building from a military base and moved it onto the property. This location is a very remote area of Georgia in the middle of the Oconee National Forest and is subject to vandalism and robbery. 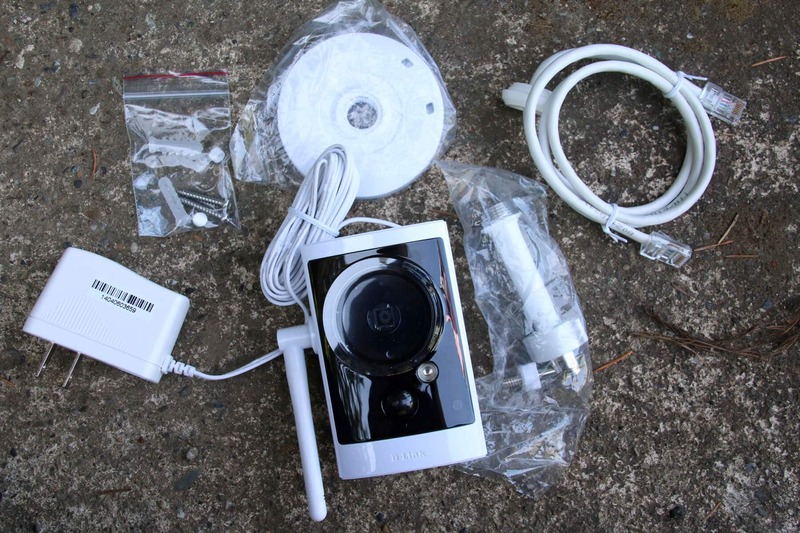 We have been wanting to purchase some form of surveillance cameras but have not done so due to limited funds/resources. Would love to be able to see our dwelling from afar. I found the review and information very helpful.Being all most deaf and handicapped,this would be a great benefit to my family and myself.We have been looking into similar products I am sold on this one. I would love to have one of these for the added protection it will offer. I live in a remote area and have had neighbors share stories of attempted break-ins. We don’t have a whole lot worth taking, but the peace-of-mind would be priceless. We have some squatters living on the property next to us and it will be a while before the bank and everyone are able to kick them out. There are lots of shady things going on and neighbors being robbed. We are going to need cameras for security soon. We are on a thru road that gets alot of foot traffic – the neighborhood frowns on fences so we feel wide open to intruders. This would be great for monitoring especially while away. I spend a lot of time traveling and it would nice to have a sense of “security.” I would love the extra protection provided by this system. I’d love to add cameras to our home because i am often alone and it would give me a little extra peace of mind. 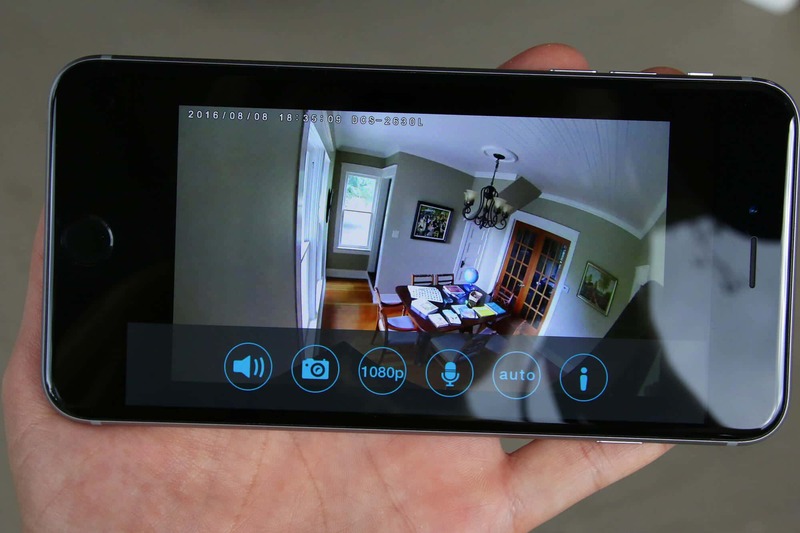 I would use the camera to help me feel safe and it would be great to monitor my home while away at work or out of town. 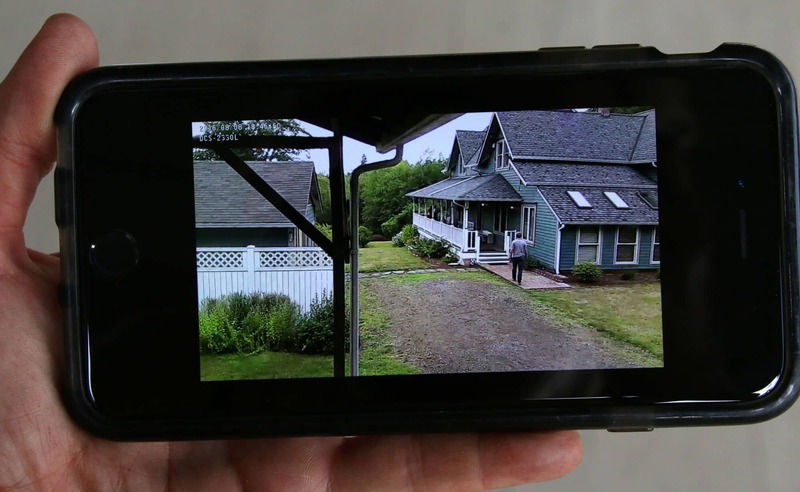 I would actually love to have a camera like this for my Dad’s house – he lives across town and it would be great to be able to check on him and the house on the days I am not driving over to bring him dinner. I would love to be able to give this to my daughter whose house has been robbed once already. It would give me greater peace of mind for her to have one. Our home was broken into on christmas eve a few years ago. We have always been scared now. This would help bring some ease to us. Thanks for the chance! I want to check on the house when i’m at work. I would feel more at ease being able to check the house while not at home. 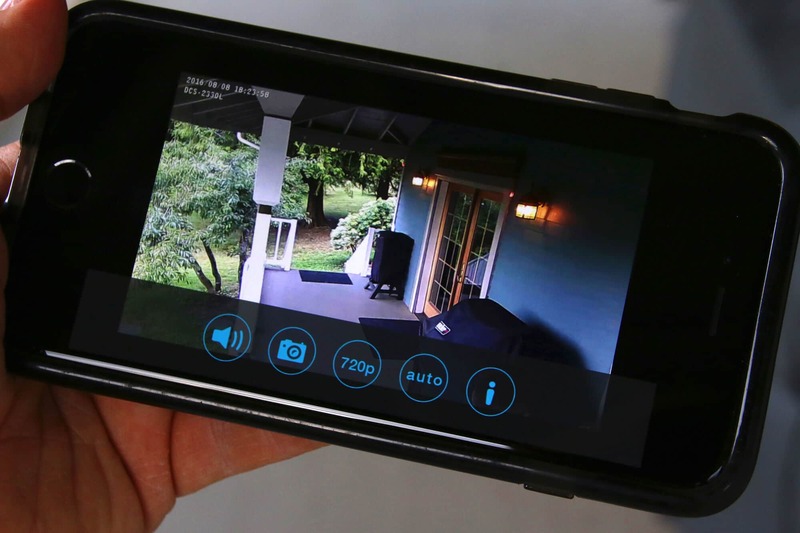 I’d love a camera for my home for my peace of mind because we live in an area where property crime rates are high. I would love to use this off our patio for peace of mind. I would love to have this for my cat shelter. I shelter elderly cats. Like a retirement home for people. I live in the country, so I’d like to have this for the night time. Racoons and opossums are always out at night. Do we still put an o in front of possum? I would use the camera to spy on my dog while I’m at work. I would like one for security purposes. I would install it in our living room area. I would place it at the front of the house to keep my family safe. I would love to win this for my daughter to feel safe in her new home, plus she can see what her pets are doing when she’s at work! I would love to use this camera to see what my dog is up to when she’s home alone…and also my older kids! For my aging mother to help her feel & be safe! I would love for a sense of security especially when I am alone. I would set it up on my front porch. This would great to have for home security. I would place one at the front of the house and one for the back of the house.